This blackjack variant is played with 8 decks. 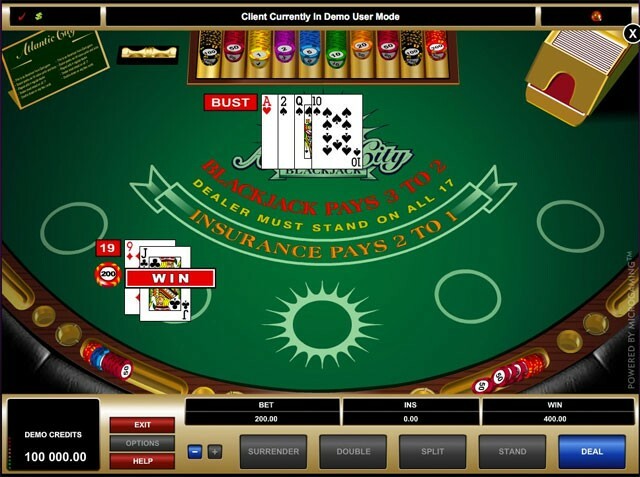 Its main distinction is the late surrender rule, so a player can choose to take a surrender only after the dealer’s hole card has been checked for a blackjack. Doubling down is allowed on any hand after a player has been dealt the first two cards, and after splitting. The maximum number of splits is three, thus a player can hold not more than 4 hands. The dealer stands on all 17 hands (soft and hard). The house edge for this variant is 0.35%. Atlantic City is released by Microgaming, Criptologic, iSoftBet and WGS.